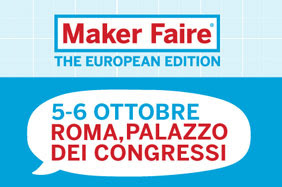 This is the first time that the Maker Faire comes to Europe, and we are fortunate enough to host it in Rome, from the 3rd to the 6th of October. This is going to be a great opportunity to showcase both Europe’s and Italy’s best and greatest technologists, hobbyists and professional makers. More than 150 exhibitors have already signed up to showcase their projects… and there will be a great 3D Printing Exhibition. dPixel will be present to showcase the work we have been doing during last Spring and Summer, travelling around Italy with the Barcamper: on the 4th of October the Maker Faire will host a Techgarage with the best projects we met. We are quite proud of the teams, so if you are around Rome during that week, do not miss out the event.